It may not be as popular as the leading brands, but the Earthborn Holistic dog food brand can definitely slug it out with the best. Unlike brands from giant pet companies that are filled with empty calories, low quality ingredients, and non-animal proteins for first ingredients, the range of Earthborn Holistic grain free formulas strive to remain true to the vision of its founding fathers. Established in 1926, Earthborn dog food has been providing the pet world not only with nutritious food, but also safe and high quality pet diets. In light of the increasing number of Earthborn Holistic dog food reviews, we’re more than compelled to make a review of our own so that we can either support or refute the claims of many reviews about the brand. We’ll start with the brand’s 5 bestsellers. 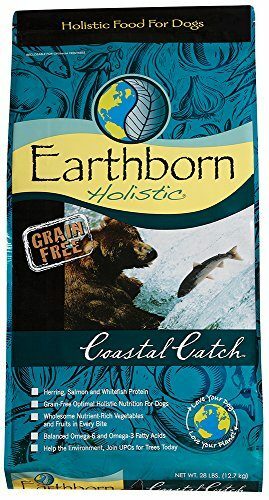 Imagine giving your pet some of the ocean’s greatest, most nutritious bounties like herring, salmon, and whitefish and you’ll know that this Earthborn Holistic puppy food is like formulated especially for your young hound. These ingredients are rich in both DHA and EPA, two of the most clinically-important essential fatty acids in the known world and well-regarded for their amazing benefits in terms of nervous, cardiovascular, and immune system health. 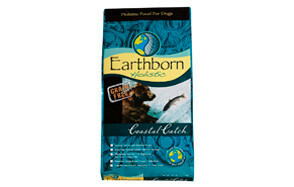 This Earthborn puppy food has the right blend of healthy carbs for the energy of your little pup and high-quality proteins and fats sourced from the best of the ocean for healthier, more vibrant coat and skin. There are 4 strains of gut-friendly microorganisms, too, aiding in your young dog’s digestion so that every bit of nutrient from its dog food will be easily digested, absorbed, and utilized for optimum development. The Coastal Catch is a seafood platter cooked especially for your young hound. Get your dog ready for a meal that is guaranteed to make it go crazy for all the right reasons. The Great Plains Feast features some of the leanest red meats you can find in this part of the country with an exceptional blend of fruits and vegetables to give your pet a meal that is definitely like the good traditional cuisine of the Great Plains. Not all brands of dog food manage to put bison into their formulation, instead opting for the more traditional beef. For its high protein and calorie content, this formula might as well be the Earthborn puppy food you’ve been looking for. Of course, it could also serve as a healthy diet for your highly active adult hound because of the premium quality proteins that it contains. 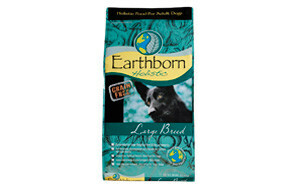 This Earthborn Holistic grain free formula is always a joy to give to pets because of its well-balanced composition. 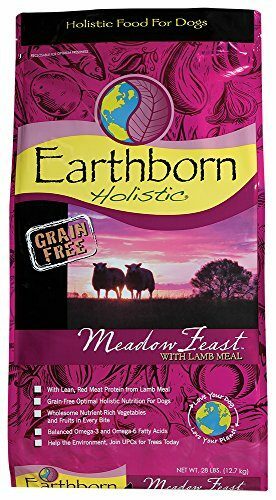 This Earthborn Holistic dog food boasts of the goodness and delicious taste of grass-fed lamb, blended with the meadow’s rich bounty of lentils and fruits. It may have lower protein content than the first two products in this list, but this formulation of Earthborn Holistic grain free still complies with the optimum nutrient requirements for dogs. It is perfect for making sure your dog gets all the nutrients it needs plus the right amounts of energy to lead an active lifestyle. The use of lean, red lamb meat sure can titillate your dog’s palate, making sure that it has the appetite to finish its meal. With essential fatty acids working to improve your dog’s immune system, coat, and skin, this Earthborn dog food formula is always a worthy option for those who want to improve not only the appearance of their hounds but also their overall health. 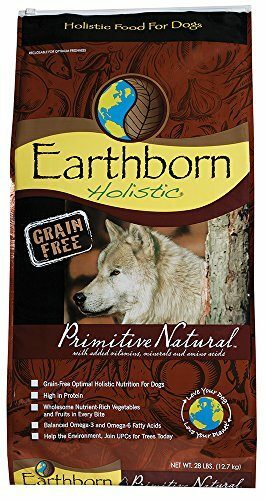 The Earthborn Holistic Primitive Natural formula of dry dog food relies on the protein-richness of turkey as its principal protein and complemented by equally-nutritious chicken and whitefish. This unique formulation gives it one of the highest protein levels we’ve seen in a dry dog food, making it exceptionally appealing to per parents who have muscular and highly active pets. Its high protein, high calorie formula is perfect for such dogs. Like all Earthborn dog food, the Primitive Natural doesn’t include any gluten, making it friendlier to your dog’s tummy. The DHA contained in whitefish is also ideal for developing puppies making this variety a good Earthborn puppy food. The antioxidant-rich blend should help your hound grow to become one of the healthiest in your neighborhood. Designed for the mammoths of the canine world, this Earthborn Holistic dog food features two very important substances that all large and giant breeds of dogs need: chondroitin and glucosamine. Calcium and phosphorus further strengthen your large dog’s bones to help it accommodate its massive size. 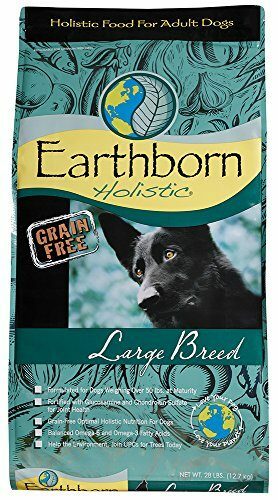 While its ingredients are just like any other dog food brand, the Earthborn Holistic grain free for large breeds comes with whitefish and egg to provide your pet with complete nutrition. It also has 4 strains of lactobacillus and enterococcus species to improve your hound’s digestive functioning as well as boost its immune system. This formula is quite unique since it comes with moderate amounts of calories and proteins so as not to overburden your large pet. It’s a dog meal that’s big in nutrition and definitely big in flavors, perfect for the big dog in your life. Believing that pets deserve not only the highest possible quality of nutritious food, but also the safest, Earthborn Holistic is a brand that strictly complies with the standards set by various government regulatory bodies and reputable third party organizations when it comes to well-balanced, complete canine nutrition. Midwestern Pet Foods is the parent company of Earthborn Holistic. Midwestern was established in 1926 and is now run by a member of the 4thgeneration. Every raw ingredient that the company receives from its supply partners is individually tested for the presence of toxins, melamine, salmonella, water activity, and even peroxide value. These tests are considered as crucial in helping the company live up to its vision of providing pets with the safest and most nutritionally-sound diets. Partner suppliers also conduct their own tests to ensure quality. Technically, there are three points upon which quality control is established in every product that comes out of the brand’s Illinois, Oklahoma, or New York manufacturing facilities. Suppliers run qualitative tests on the raw ingredients. Midwestern conducts a 2nd test of these ingredients upon delivery. Finally, all products are tested before they are packaged and shipped. This is the brand’s guarantee of safe pet food. The brand is best known for its use of high-quality novel proteins like lamb, bison, turkey, whitefish, herring, and a whole lot more. It is also valued for its insistence on not using wheat gluten, corn, and soy; although it does have a propensity to use powdered plant-based proteins in its formulations to boost the protein content of the variants. On a positive note, the brand has yet to experience product recalls, whether mandatory or voluntary. 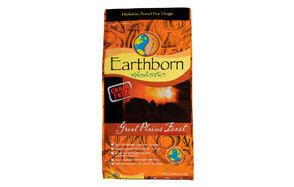 If you want high quality animal proteins for your dog, then Earthborn Holistic grain free dog food is for you. The brand not only utilizes high quality proteins it also uses novel proteins in many of its formulas. We say ‘many’ because there are still variants that use chicken and beef as principal proteins. This should appeal to pet parents who are more comfortable with animal proteins that their pets have no issues with. However, for those who may have hounds that have sensitive tummies especially to very common animal proteins, then the unique formulation of the brand incorporating novel animal proteins should be one of the reasons for giving this dog food to your pet. Of course, it is also perfect for those who would like to give their pets a different meal without causing hypersensitivity reactions. If you’re nervous about wheat gluten, soy, or corn, don’t be as the brand makes sure there are none of these allergenic grains in its formulas. While most veterinarians say that gluten allergy in dogs is nothing more than a product of the tendency of pet parents to extend well into their dogs whatever conditions they may have. But, if this will make you feel safer and sleep better, then you’d find the grain free formulation of Earthborn Holistic dog food to be just right. Where some very popular brands put artificial flavorings, colorings, and preservatives in their dog food formulas, you’ll feel more secure knowing that Earthborn Holistic doesn’t include any of these harmful substances into your dog’s diet. All the company ever cares about is the safety of your pet and that includes providing nutritious and safe pet food. Every pet parent only wants the best for his or her dog. You can get that with the Earthborn since they take to heart the recommendations of AAFCO, making sure that every dog food that is ever formulated, packed, and shipped from their facilities more than meets the need of dogs for complete and well-balanced nutrition. A number of Earthborn Holistic dog food reviews are a bit divided on the quality of the ingredient formulation of this brand. On one side are those who say that it has one of the best nutrient profiles for dogs while on the other are those who counter such claims. In this review we’ll offer our own analysis of the brand’s ingredients based on the products we’ve listed herein. Based on the 5 products we’ve included in this review, Earthborn Holistic dog food comes with an average crude protein content of 31% which can be recomputed to bring a dry matter basis for proteins at 34.44%. We just would like to reiterate that this is the average of the 5 products. Individually, the Earthborn Holistic Primitive Natural provides the highest protein content at 38% or 42.22% on a dry matter basis. This underscores the high variability of the brand’s formulation. We do have some concerns on 3 of the reviewed products of the brand. These had an average protein content of 33.7% or 37.4% dry protein matter. 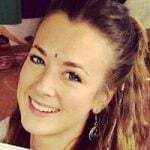 The issue is in the inclusion of pea protein which some Earthborn Holistic dog food reviews point as a reflection of the brand’s attempts to downplay the importance of animal proteins. True, the company puts animal proteins as the principal ingredient in these variants. However, with the addition of pea protein, one cannot help but think that the amount of animal proteins is less than the printed amount of proteins in the label. Sadly, there’s no way we can quantitatively determine how many percent of the 37.4% dry protein matter is actually animal protein and what percent comes from plants. Nevertheless, this is often brushed aside as a minor issue since the brand more than satisfies the current recommendation of using animal-based proteins as first ingredient. Moreover, many of their variants utilize novel proteins like bison, whitefish, herring, lamb, salmon, and turkey, among others. Chicken is still used in some variants which, unfortunately, defeat the purpose of going for grain free formulas. Earthborn dog food, on the average, contains about 16.8% fats or about 18.67% when the moisture content has been deducted from the computation. This is well within the average fat content of most dog food brands, although some variants like the Large Breed formula has less fat at only 13% or 14.4%. What is actually noteworthy is the combination of ingredients that provide a near-ideal ratio of essential fatty acids between omega-6s and omega-3s. Where other dog foods can come with an unusually higher proportion of omega-6 fatty acids, Earthborn dog food manages to keep it to 2:1 or at least 4:1. Now that is truly something. On the average, Earthborn Holistic dog food provide 42.2% of carbohydrates typically in the form of lentils like peas, starches like sweet potatoes and potatoes, and other vegetables and fruits like apples, cranberries, carrots, spinach, and blueberries, among others. The ingredient mix in Earthborn Holistic grain free formulas gives it a nutrient profile that is rich in vitamins, minerals, amino acids, and fatty acids. In some variants, there is glucosamine and chondroitin, too, although the AAFCO doesn’t really recognize these as essential. At the very least, one can feel confident that what you’re giving your dog are the nutrients it needs for optimum development and growth. 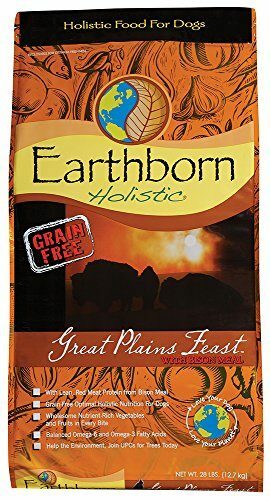 Earthborn Holistic grain free dog food is a brand that is perfect for pet parents who are after friendlier tummies for their pets. While the brand uses mostly novel animal proteins in its formulas, we’re a little bit boggled by the need to add pea protein in most of its varieties. Nevertheless, if it’s safe and quality dog food that you’re after and you don’t mind the hefty price tag, then the Earthborn dog food is always a good choice.